GCS has just launched its 2013-2014 programme of concerts and events and we are very excited to be working with some great musicians to present some superb choral music. We have the incomparable Emma Johnson, the marvellous James Gilchrist, the wonderful Alwyn Mellor, a return for the sublime Hye-Youn Lee, the Bournemouth Symphony Orchestra, the Corelli Orchestra and many others. As ever, we continue to rehearse and perform in the fabulous surroundings of Gloucester Cathedral. 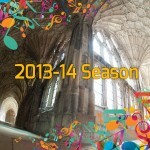 Tickets went on sale to Patrons and Friends of GCS on 13th July 2013 for a priority booking period before going on general release on 27th July 2013 to coincide with the first day of the Three Choirs Festival in Gloucester.